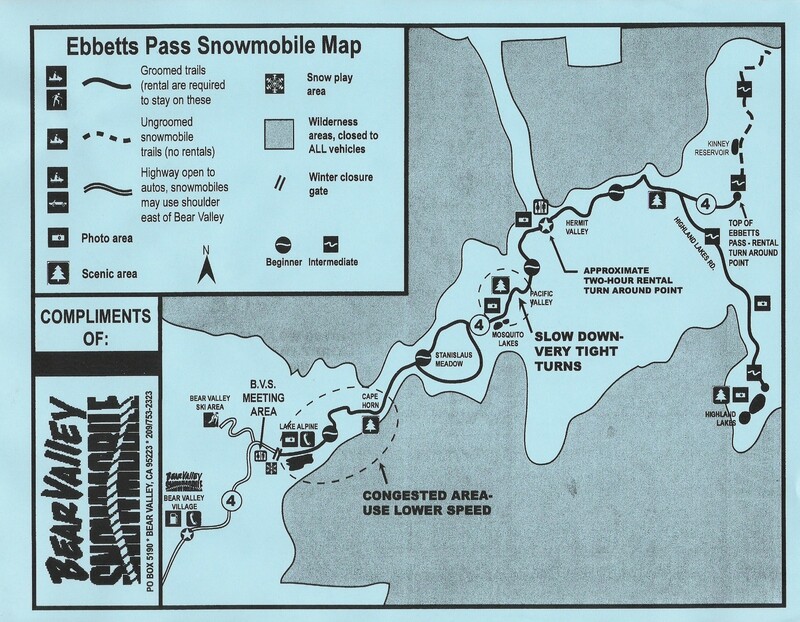 Bear Valley Snowmobile is the only place where you can rent snowmobiles by the hour out of Lake Alpine and Spicer Sno-Park for self-guided tours in the pristine wilderness, along the Ebbetts Pass National Scenic Byway. Season begins when Highway 4 is closed due to snow. For the best pricing and best snowmobile experience, come rent a snowmobile by the hour with Bear Valley Snowmobile to enjoy the beautiful groomed trails of Stanislaus National Forest. Enjoy scenic views of Lake Alpine, Spicer Reservoir and many other points of interest. Fun for the whole Family! Kids as young as two can ride their snowmobiles with the help of a five-point harness that attaches them to an adult. This is the only snowmobile rental operator that has the privilege to rent and patrol snowmobiles in this breath taking environment. Their snowmobiles are staged for you in the USFS Sno-Parks so there is no need to trailer or make unsafe crossings over Hwy 4 from Bear Valley. Also, for your safety, they have a two snowmobile minimum per rental during your self-guided tour. Either make reservations with their on-line easy check out calendar, or give us a call at 877-HWY4-FUN (877-499-4386). If you see “CALL to RESERVE” on the calendar this is our busiest time so as not to over book we require phone reservations in order to ensure real-time booking protection. ARRIVE AN HOUR BEFORE YOUR START TIME FOR THE ALPINE AND SPICER trails at their shop at 3 Bear Valley Road inside the Lodge to allow for time to fill out the paperwork, helmet fittings and the 2-4 mile drive to the trail head at the Sno-Park. To rent snowmobiles for the Bear Valley 10 mile long groomed trail we offer snowmobiles with trailers (great for kids!) on a first-come-first-serve basis. During the holidays please allow a 1/2 hour for possible wait times.